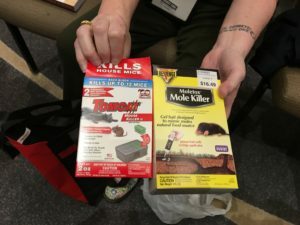 This weekend I attended my first mystery conference, Malice Domestic in Bethesda, Maryland. I didn’t know what to expect as I walked into the room. I describe myself as friendly and I enjoy meeting new people, especially writers and readers. Writing is a solitary profession and it can get lonely sitting at your computer day after day. But I also get nervous walking into a room full of new people–many of whom already know each other. I was pleasantly surprised to find everyone very welcoming. Every person I spoke with was happy to hear that it was my first Malice Domestic. Many helped answer my newbie questions. It’s a mystery reader’s fan conference and the attendees were fans as well as authors. Everyone was interested to hear that my first cozy mystery will be published in March of 2018 with Kensington Publishing. The panels were wonderful. Authors gathered to discuss their books. I wish I could have attended all of the panels, but I had to choose. 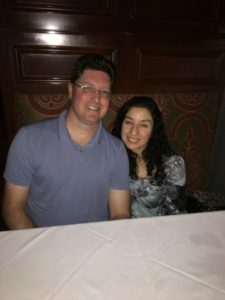 I attended the Murder on the Menu: Food & Mysteries panel. My Kebab Kitchen Mystery series is most like these cozy mysteries that feature delicious food and recipes. Yum! 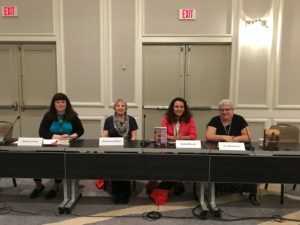 I went to the Murder and Crafts panel and was amazed at the creativity of these authors. The Rural Murder, Dynamic Duos, Murder Empire: British Empire Mysteries, Entrepreneurial Sleuths panels were all wonderful as well. I know I picked up books by new authors in the Dealers Room. 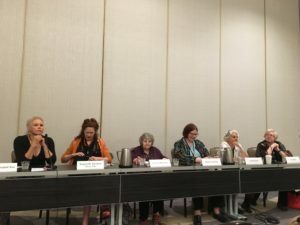 I especially enjoyed the New Kids on the Block: Agatha Best First Novels Nominees panel as well as the Sunday morning breakfast where all the new mystery authors were briefly interviewed. It was fun hearing the debut authors talk about their books and their path to publishing. I look forward to sitting on that panel and being interviewed at the Sunday breakfast next year. Elaine Viets was the guest of honor, and Charlaine Harris received the lifetime achievement award. Both of their interviews were wonderful, funny, and inspiring. The Poison Lady: Fan Guest of Honor Luci Zahray was fabulous. The room was crowded and people were taking notes. Where else can you find a group excited to learn about the poisons available at your local supermarket and how they can be used to kill someone or just make them sick for a certain time period? The absolute best part of Malice Domestic were the friends I made. I’ll be back next year with copies of my debut, Hummus and Homicide! Here’s a picture of me with my hubby. John supports my writing and takes care of the kids when I write.